Lots of media outlets are picking up the story first reported in the Wall Street Journal that cities are growing faster than suburbs. See here, here, and here for samples. A few things about these data that suggest we should interpret the results with caution. First, these are growth rates, not absolute numbers. Because central cities make up a minority share of regional population most population growth--by a lot--is happening in the suburbs. Consider Atlanta, the second fastest growing city compared with its suburbs according to the chart at top. Atlanta has 432,427 people as of July 2011 and grew at 2.4%. The suburbs have 4,926,778 in July 2011 and grew at 1.3%. Here is the data source. This means that the metro growth was 73,361 for the year, 10,135 settled in Atlanta and 63,226 settled in the suburbs. In percentage terms, 14% of the growth happened in the central city and 86% happened in the suburbs. That doesn't suggest a sea change in attitude. For most of the metros, the difference between city growth and suburban growth is so small I'm not sure that the difference is statistically meaningful (see the table at the data source above). 2011 are estimated data, and there is an error term associated. Perhaps all of the differences in growth rates are significant, but they have not been tested yet. There are also large variations by region of the country and metropolitan area, and there does not seem to be any obvious and coherent trend. The headline claim is that more than half of metro areas saw one year growth rates in central cities higher than for suburbs. That means about half saw central city growth lower than suburban growth. In addition, many of the faster growing central cities are growing at essentially the same rate as their suburbs for the one year period in question. There very well may be a shift in preferences and behaviors happening, and I suspect there is because preferences and behaviors are always changing. I just don't see that the stories highlighted here provide strong evidence that a large shift happened in 2010-11. Lastly, let's look at how some central cities that have received nice press about robust growth fared. Here is my post from May 4 titled "Can We Exaggerate the Significance of Cleveland's Downtown Population Gains?" and, yes, we can exaggerate the importance of a few people moving to downtown Cleveland. Cleveland shrunk by a rate (-.6%)greater than the rate its suburbs shrunk (-.3%). Cincinnati has also been celebrated recently (see here and here and here for a few examples). 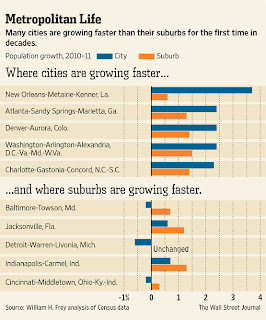 That's going so well that the city is declining while the suburbs are growing (see above graphic). I'm happy that many cities are doing well and growing. I hope the trend (if there is one) continues and expands. I'm just not sure there is any evidence of a broad trend yet. ***This post was updated to correct typos in the Atlanta data in the first paragraph. I'm sure someone has done it, or probably thought about it, but what about the central city plus first-ring suburbs compared to the rest of the metro area? Total growth picture may be different. you're right saying it's not all about growth rates. and definitely there are some important regional differences to be taken into account. Certainly small changes and differences shouldn't be exaggerated. And there are significant differences within the suburbs as a whole, and within central cities. Still, just parity between city and suburban growth rates is an enormous change from the whole second half of the 20th Century. It had become axiomatic that growth would occur in the suburbs, while cities would decline or at best stagnate. The shift is significant and worth noting.